Eight&Haiku&by&& Richard&Wright& for$violin$and$marimba$ ! ! ! ! ! ! ! ! ! ! ! ! ! ! ! ! ! ! ! ! ! ! ! Richard! Wright! (190811960)! is! best! known! for! his! fiction,! particularly! his! incendiary! novel! Native$Son,!published!in!1940.!These!haiku!were!created!during!Wright’s!self1imposed!French!exile,! in!the!final!year1and1a1half!of!his!life.!Wright!culled!817!haiku!from!the!4000!that!he!had!written!to! be!published!as!This$Other$World:$Projections$in$the$Haiku$Manner;!I!selected!eight!of!these!to!represent! musically,!in!the!form!of!miniatures!for!violin!and!marimba.!Wright!uses!stark,!evocative!imagery! within! the! concise! Japanese! form! to! depict! both! natural! and! urban! landscapes,! the! latter! more! familiar! from! the! author’s! literary! masterpieces.! On! the! surface! these! are! spontaneous! word! paintings,!but!a!closer!look!reveals!great!discipline!and!craftsmanship,!in!an!economical!form!of!self1 expression.!! ! 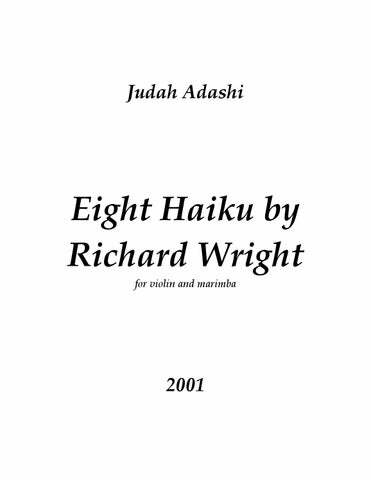 Suite:$ Eight$ Haiku$ by$ Richard$ Wright! was! recognized! with! a! 2001! BMI! Student! Composer! Award,! and! was! the! winning! work! in! the! Auros! Group! for! New! Music’s! 2002! International! Composition!Competition.! ! ! ! ! ! ! ! ! ! ! ! ! ! ! ! ! i. Across the river Huge dark sheets of cool spring rain Falling on a town. *N.B. Directions pertaining to "dark" (D) and "bright" (B) apply to both hands of the marimba part. The dotted line (---) does not signify a steady maintenance of a single timbre, but rather a graded continuum: the desired effect is to be achieved by starting at the tip or fluff of the mallets and gradually moving down towards the head of the mallet, or vice versa, as indicated. © 2001 by Judah E. Adashi | BMI Haiku copyright © 1998 by Ellen Wright. Reprinted from Haiku: This Other World by Richard Wright, published by Arcade Publishing, New York, New York. U # œ œ- - n ˙˙ n œ # œ # œ b œ œ œ œ # œ œ œ œ œ œ- œP ƒ f U ! ! Cadenza poco a poco accel.
" 27 >œ. œ. > b œ. > b œ. > ? 6ˆ2 4 . . œ 8 b œ 4 b œ. > œ. # >œ. 6ˆ2 8 œ.
p >œ. >. b œ. >. b œ. 2 > 6ˆ2 8 œ. œ b œ 4 b œ.
Ÿ~~~~~~~~~~ 44 42 ˙ 42 œj œ. > b œ 6ˆ2 8 b œ.
F > œ. ? 6ˆ2 8 n œ. > b œ 6ˆ2 >œ. œ 8 n œ. œ b œ. > b œ 6ˆ2 œ 8 n œ. b œ. > b œ 6ˆ2 > œ. 8 n œ. b œ. 2 ‰ j 4 œ œ œ œ bœ œ œ P 2 j j nœ 4 # œ œ œ P > œ. >. b œ. >. b œ. 2 œ bœ 4 n œ. > œ. 6ˆ2 8 n œ. 24 b œ b b œœ n œ 68 b œ. .
>œ. b œœ- n œ .œ œœ 2 b 4 b œ b œ. nœ . j & 42 œ œ. Mrb. F j bœ b œ œ 6ˆ2 >œ. n œ. 8 nœ b œ. ‰ # œj ‰ .
. 24 j ‰ b œ. ‰ 68 j Œ œJ Œ n œ. J n œ.
. 24 n œ. ‰ b œJ ‰ 68 n œj Œ J . ‰ # œJ. n œ.
œ .. b œ œ # œ œ œ ..
*N.B. Right foot stomp with ball and flat (higher pitch), left foot stomp with heel (lower pitch), as indicated. Can be performed by one player (preferably violinist), or, if desired, L/R can be split between players; also can be done using only one foot, provided that pitch distinctions remain clear. j j œ . # œ . œœ. œ œœ. b œ n œœ 42 œ b >œ. b œj œ.
j œ . . >j œœ. b œ n œœ 42 œ b œ. b œ œ. >. b œ. œ ! b œ œ 6ˆ2 >œ. n œ. 8 nœ b œ.
j j j œ œ . #œ . > j 6ˆ2 œ 2 8 œœ. œœ. b œ n œœ 4 œ b œ. b œ œ. >œ. b œ. œ ! Œ. > bœ œ b œ. 42 . b œ b œ.
P j bœ - > n œ œ.
b œœ- > # œ.
iii. From a tenement, The blue jazz of a trumpet Weaving autumn mists. 43 œ . œ n œ . œ. % . If desired, movements iii/iv can be elided (attacca, senza interruzione) for dramatic effect and contrast. v. A spring sky so clear That you feel you are seeing Into tomorrow. & 68 œj . ‰ . P bœ œ œ. œ. 68 # œ œ œ Œ œ. œ- . viii. A long winter rain: A whistling old man whittles A dream on a stick. & #˙. æ P ? &œ œ œ œ œ œ œ œ œ œ > . > . > . œ œ œ. > bœ. œ % œ #œ ‰ &R Mrb. &œœ œ œœœ >. - >. subito p 297 ? >œ œ. œ- œ >œ œ.
œ- œ œ œ. > P œ- œ >œ œ.
œ œ œ œ œ œ. œ- œ > . > >œ . œ- œ œ . > f œ œ >œ œ.
of the three middle fingers or with knuckles on the back surface of the instrument. 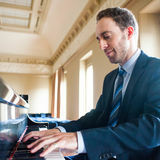 The player may require a chair, in order to quickly sit down and lay the instrument across their lap to facilitate playing, or the instrument can be held up at a distance from the body (the visual effect is stronger this way). If seated, use both hands: LH (L) should be placed so as to generate a lower pitched sound, RH (R) to generate a higher pitch, as written. Otherwise, the player must use one hand and mark accent patterns as clearly as possible. The bow can be laid aside on the music stand. œ & œœ œ > . ?œ œ œ œ > . œ œ œ œ > . ¿ & ¿¿ ¿ > . ? ¿ ¿ ¿ ¿ > . Pick up bow and resume standard playing position. & œ. ƒ & ‰.